Every March, the Florida Panhandle hosts thousands of spring break students of all ages and from all areas of the country. While most come to our state to enjoy the surf and sand, other spring breakers arrive to volunteer. 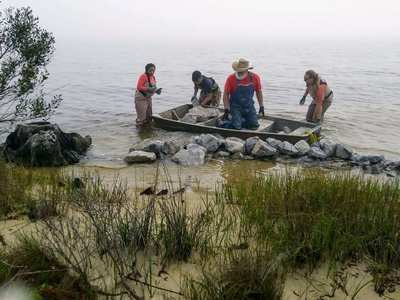 This month, multiple groups worked with the Choctawhatchee Basin Alliance (CBA) to build reef breakwaters and living shorelines to make our watershed a better place. 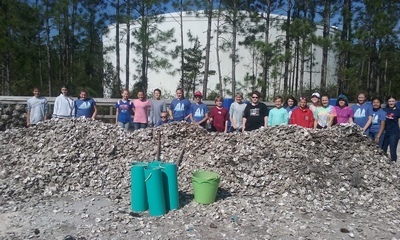 In just one week, three spring break groups worked as part of CBA’s restoration program. 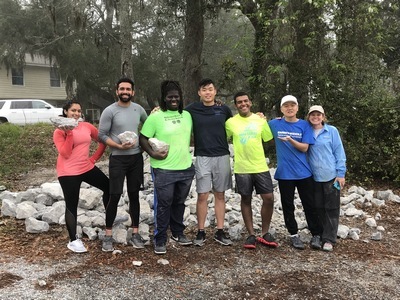 On a misty, cloudy day along the Choctawhatchee Bay, eight students and staff from the Embry-Riddle Aeronautical University moved 10 tons of limestone rock to create new segments of reef breakwater in Florida Park, that’s more than a ton per person! CBA is not alone in offering alternative spring break trips for students who want to volunteer. 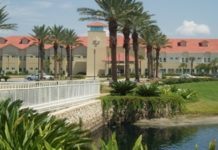 Habitat for Humanity, United Way, and more provide short-term volunteer opportunities for interested universities, colleges, and K-12 schools. CBA offers volunteer opportunities for all ages, throughout the year. For more information, see basinalliance.org.